Yoghurt & Pink Grapefruit: Mixed flavours of mildly sour yoghurt and juicy pink grapefruit. Mixed Tropical Fruits: Well-balanced sour and sweet pink guava, passionfruit and pineapple flavours. Mango: Sweet burst of ripe mango flavour. Acai, Banana & Red Grape: Contains 'superfruit' Acai, known for its weight loss and anti-aging properties. 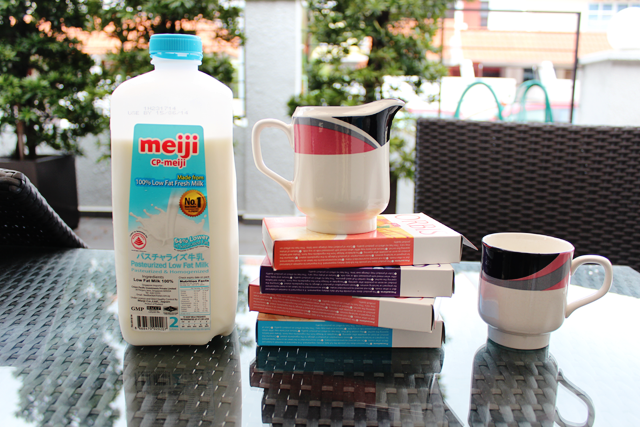 Each packet of Petit Shake, when mixed with 100ml of cold milk, makes up 150kCal approximately. A month of these shakes reduces calorie intake and helps to bring about a weight loss of approximately 2.5kg of body fat. Of the 4 different flavours, Mango is my favourite. 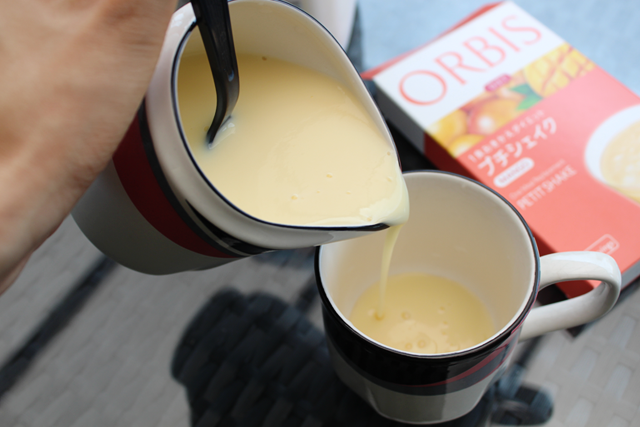 It tastes almost exactly like a mango yoghurt smoothie; sweet (Not diabetically sweet. Just right. (: ) but with an edge of tanginess. For me, I don't use this to replace an entire meal because I'm really quite skinny (Thanks Mum, for the metabolism rate.). But I do get hungry easily so I snack a lot, especially in the afternoon. So I drink one of these shakes around 3pm, to replace all my (very unhealthy) tidbits and it lasts me all the way till dinner time. It really helps when I go for my evening jogs because I usually get hungry halfway and it totally zaps away the fun (Running IS fun.). 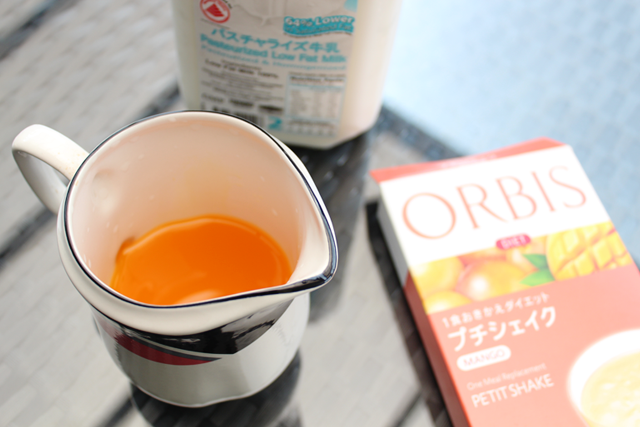 The Petit Shakes are very easy to make. It consists of just 3 simple steps. Step 1: Empty the packet into a cup. 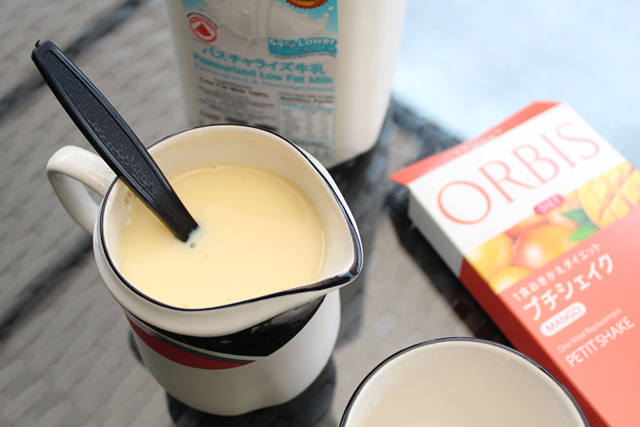 Step 2: Add 100ml of cold milk. Step 3: Blend well till the beverage thickens. Psst! The Petit Shake is a one-meal replacement, so do take note that you don't replace more than 1 meal in a day. 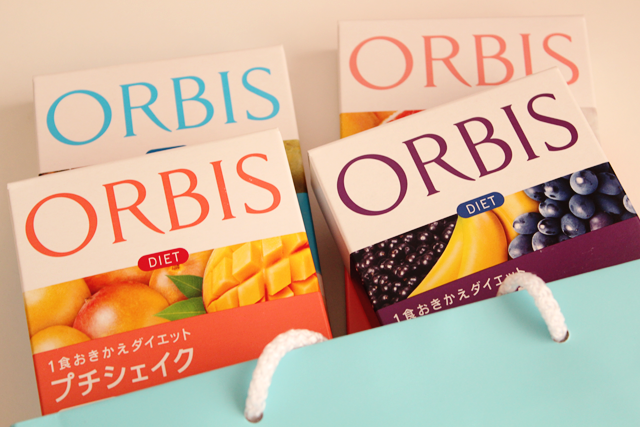 The ORBIS Petit Shakes retails at $8.90 and $6.90 per box of 2 servings, for limited edition and regular flavours respectively. They can be found in Robinsons Orchard Level 1 Beauty Hall, Bishan Junction 8 #01-46 and Raffles City Shopping Centre Level 1 Beauty Hall. WORLD CUP 2014: Soccer Season Match Schedule!